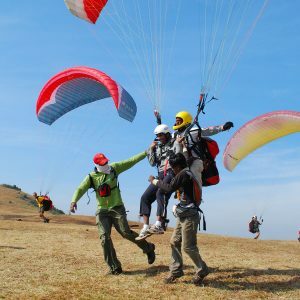 If you want to try your hand at paragliding but don’t want to commit to learning the sport , our paragliding joyrides (tandem paragliding) flights are the perfect option! Soar high in the sky with one of our experienced pilots at one of our 3 nearby sites. The Pilots will do all the work, all you have to do is sit back, relax and enjoy the ride of a lifetime! 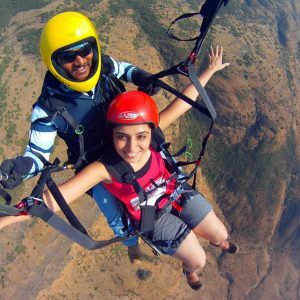 Paragliding joyrides or Tandem Paragliding is the easiest and safest way for absolutely anybody and everybody to experience the joy of the skies. You do not need to learn to fly, no prior experience needed at all. 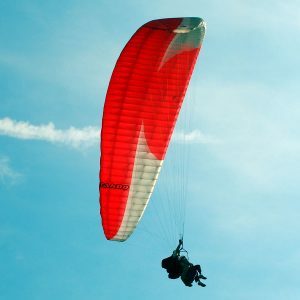 Tandem paragliders have larger wings than solo gliders so that they can comfortably accommodate both the pilot and his passenger. 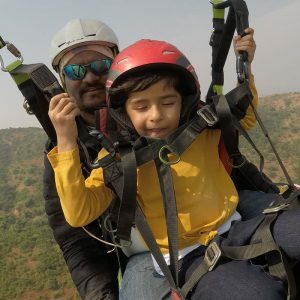 At Indus Paragliding we offer 'Tandem' or ‘dual’ paragliding joyrides with all of our extremely experienced Pilots for people above the age of 10. Flights typically last about 10 minutes and we guarantee that you will have the time of your life! 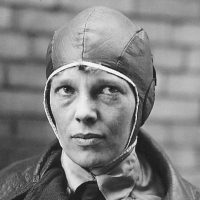 An introduction to the joy of flying. 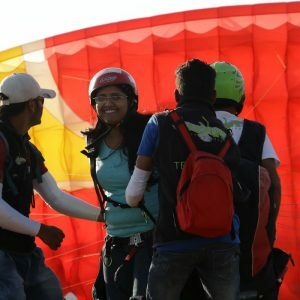 The Indus GO paragliding Joyrides are perfect for any one who wants to give paragliding a go!. 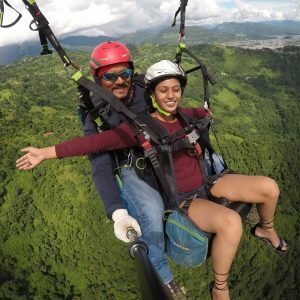 Each ride with an experienced instructor lasts 10 – 12 minutes and allows the passenger to feel the thrill of soaring high in the sky. Not at all for the faint-hearted, this Indus ACRO Joyride is for those who wish to test their adrenaline. 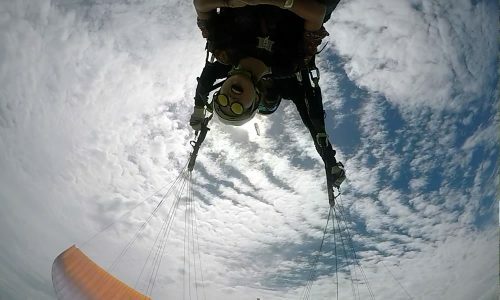 This gravity force game of quickly fluctuating altitude is professionally and safely performed by our specialized pilots. Lungo (Italian for “long”). That simply defines this joyride. Indus LUNGO is the longer version of our Indus GO flight. All ingredients of the GO flight with a much longer duration for you to enjoy this awesome aero-sport to your heart’s content. The package also includes the flight video. 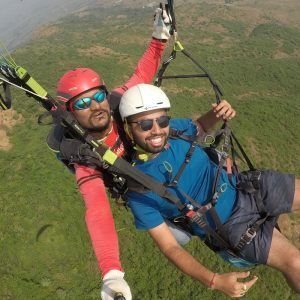 Paragliding is a weather dependent sport. Safety of our passengers and our crew is our top most concern. If the weather is not suitable we will not take-off. 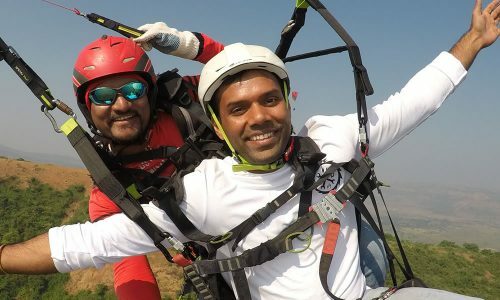 Though it is very safe for any person to take up Tandem Joyride flight, basic fitness is expected in making a smooth take-off and landing. 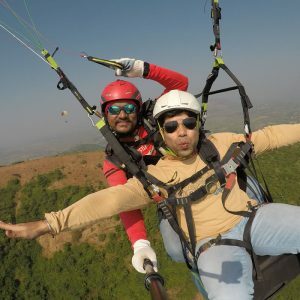 If you have any heart related issue or hypertension, we suggest you consult your medical professional prior to taking up a tandem flight. The Tandem Pilot and/or our coordinator at the flying site will decide on the passenger they wish to take-off with. This is solely on the basis of wind condition, weight of the passenger, pilot and the allowed weight range of the specific wing/equipment. Transport to the flying site is not included in the flight cost. You have to reach the take-off point on your own. We are happy to provide assistance in getting transport to the take-off point if required. 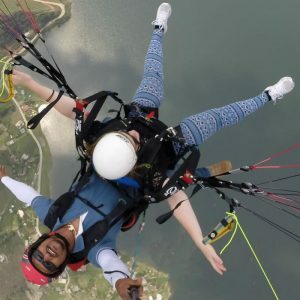 Video & Photographs of your tandem flight are not included in the flight cost. This service is optional for a small cost of Rs. 500/- per flight. The video & pictures will be sent to you via email (Google Drive) or can be transferred to your Mobile device after the flight. You can optionally use your own microSD card for video recording. - Preference of flight will be given to bookings made in advance with part/full payments done by the passengers. - Flights cancelled due to bad weather are fully refundable or can be rescheduled for a later date/time. - In case of cancellation by the client advance payment is non-refundable. - Avoid taking food an hour before you fly. - Flying under influence of alcohol or any substance is prohibited. - Hydration is important. Please carry a bottle of water. - You are advised to carry sunblock cream (sunscreen), sunglasses and cap/hat. - Wear long sleeves top and pants (Jeans/Track pants). Do not wear Skirts/Sarees or loose clothing. - Do not wear chappals. Wear sturdy footwear/shoes. - All valuables must be fully secured to carry along or store away during the flight. - Each passenger is required to carry a valid Govt. Photo ID proof (e.g. : Aadhaar Card, Driver's License, PAN Card). This is mandatory. - Littering at the flying site or en route is strictly prohibited. Please carry back your belongings, water bottles, trash and other left-overs with you. We prefer real email ID 🙂 , so please make sure you check it again. 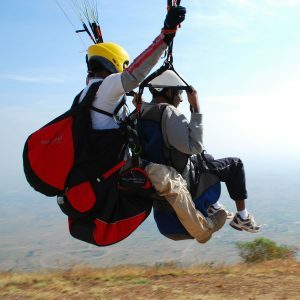 I have read all details and terms & conditions of Paragliding Joyrides.